See two of Sri Lanka’s holiest sights on a private 10-hour tour to Anuradhapura and Mihintale from Dambulla (own expense). 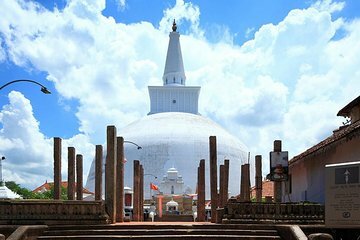 Travel by air-conditioned vehicle with a personal driver-guide, and visit the ruined city of Anuradhapura, the island’s royal and religious capital from the 4th century BC. Admire the Buddhist temples, reservoirs and carvings as your guide shares tales of the city. After lunch (own expense), explore Mihintale, a mountainside complex of shrines and caves revered as the birthplace of Buddhism on Sri Lanka. Tour this place of pilgrimage before returning to Dambulla.